According to Reuters and Spiegel, the Grand Coalition of the CDU and SPD currently being formed in Germany is abandoning the emissions target of a reduction of 40% below 1990 levels by 2020. It had been obvious for some time that the target was not going to be met. This is a big humiliation for Merkel, and shows the utter failure of her Energiewende programme, which I prefer to refer to as Energiewahnsinn (Energy madness), whereby nuclear power stations were closed down and replaced by windmills and coal mines. They claim to be sticking to the even more implausible target of a 55% reduction by 2030. Who do they think they are kidding? 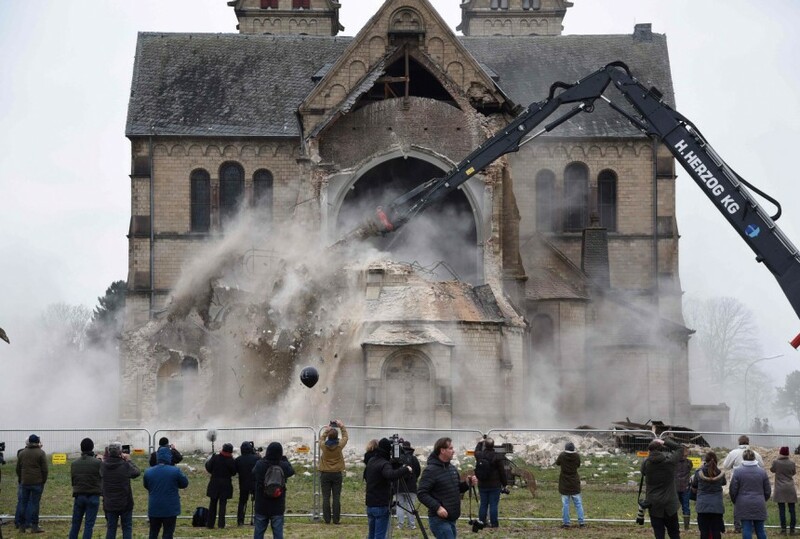 In related news, A huge church in a town called Immerath near the Dutch border is being knocked down today, to make way for a new lignite coal mine. Video here. More on the background to that story here. Wir bekennen uns zu den Klimazielen 2020, 2030 und 2050. Die Handlungslücke zur Erreichung des Klimaziels 2020 wollen wir so schnell wie möglich schließen. Das Minderungsziel 2030 wollen wir auf jeden Fall erreichen. We are committed to the 2020, 2030 and 2050 climate targets. We want to close the gap in action to achieve the 2020 climate target as soon as possible. We definitely want to achieve the 2030 reduction target. It goes on to talk of a gradual reduction and ending of coal. And how are they going to do that? Yes, you guessed it, build even more wind turbines! Another 4GW of wind to be added in 2019-2020. That’ll set the Moonbats hissing and barking, good style! They’ve just changed the 2020 target. That doesn’t mean that they will change the Energiewahnsinn. This is a significant kick in the German Green renewables by Merkel, and may not be what Macron and the EU wanted to hear. With this announcement, Merkel should be able to form a workable coalition, with German industry no longer sidelined. Other EU Members can now point at Germany’s leadership on energy. Flash: Warmist conspiracy ideation breaks out in Natural History museum. Read all about it. Mark, yes, good point. Where is Harrabin on this story? Climate Home have a report here. Ron. If that plaque was put up 25 years ago, it was probably just as offensive to warmistas then as it is now. Heads will definitely roll. Why was it put up in the first place? Why wasn’t it spotted by the greenshirts until now? Isn’t their job to spot such fossil fuel propaganda? I object to the word “believe” in a scientific institution. Ron, left a comment on your blog re. ice ages article. I think rumours that the ice age cycle is dead are greatly exaggerated. Well those that saw the new years speech that Angela Merkel held is hardly surprised at all. In the entire 6 minutes she made absolutely NO mention of the word climate or the german baby Energiewende. Every time the climate doesn’t follow the script the scientists say that natural variability is overiding CO2. Funny how something much more significant will vanish in the face of a bit of warming. I’d like to believe the scentists and think that ice ages were a thing of the past. Sir, In a literal sense, Matt Ridley (Comment, Jan 8) is right: global cooling is not worth shivering about. But he omits to mention the principal reason why: our emissions of greenhouse gases are changing the planet to such an extent as to make absolutely sure that the sequence of Ice Ages and warmer interglacial periods has been suspended. Ice Age cycles are driven by the incredibly slow changes in the orbit of the Earth about the Sun. Far from being an imminent concern, the next Ice Age is not expected for at least 50,000 years. Moreover, the latest scientific results suggest that our emissions of greenhouse gases could delay it far beyond that. It is worth reflecting on just how profound this finding is. Just 200 years of human activities have been sufficient to disrupt the natural cycle, driven by variations in movement of the planets, of the Earth’s warming and cooling — a cycle so powerful that it has created and melted ice sheets across continents and emptied and refilled mighty sea basins. Now, that is worth shivering about. Apologies to Cliscep’s already-busy intellectual property lawyers but the full context is I think needed to join wholeheartedly with your Puke! Note the gross over-certainty … “as to make absolutely sure” and “Just 200 years of human activities have been sufficient to disrupt the natural cycle” but, as always, the weasel get-out clauses “is not expected” and “the latest scientific results suggest”. Hopefully Matt will put the original article up on his blog before long. Thanks Richard. Most of us can’t see Matt’s article or the comments as it’s behind the Times paywall, though most of it can be seen at the GWPF. Yes indeed, the “gross over-certainty” – we still don’t really understand what causes ice ages so to predict the date of the next one is absurd. Combined with the pompous arrogance of declaring this “finding” to be “profound”. Worth its own post? Jaime? Definitely worth a post Paul. Speculation about ice ages (being imminent, now delayed indefinitely) has a long and inglorious pedigree in the climate debate. Actually, we’re IN an ice age right now; it just so happens that we’re enjoying a brief period of interglacial warmth. OMG, I just looked at who authored that comment; I just presumed it was from a general reader! Shocking. Definitely emetic. I am shocked that a Cambridge professor of Earth Sciences can write such appalling drivel. All one need do is look at one of those ice-core plots of CO2 and temperature. If we look at interglacial to glacial transitions, temperatures fall but high CO2 levels are maintained for tens of thousands of years, clearly indicating the failure of CO2 to offset other natural controls. Thus modern CO2 levels are also unlikely to offset natural variations if they are destined to cause a temperature downturn. I would expect a Earth Science professor to know his subject better than Eric Wolff FRS does. Is Ridley short of things to write about? It seems odd to write an article downplaying something that is on the minds of almost nobody. As I’ve said already it seems to me to be an exemplary piece of writing about science. The fact there are now 486 comments suggests that cooling being “on the minds of almost nobody” is no longer true, even if it was when Matt began! A few comments. Glacial/inter-glacial transitions are thought to be triggered by insolation changes at high northern latitudes. It seems likely that the initial shift is due to albedo changes from ice sheet retreat/advance (depending on which way it’s going) and vegetation changes. This then leads to further warming/cooling that produces changes in atmospheric CO2 which also produces further warming/cooling. So, It’s not only CO2 that contributes to the temperature changes. Also, the ice core records tend to show temperature locally, while CO2 is well-mixed. This means one should be slightly careful of how one interprets the relationship between CO2 and temperature in these records. As far as I’m aware, we’re currently near a minimum for solar insolation at high northern latitudes, and we’re not heading into a glacial. In fact, we’re currently going in the opposite direction. Our emissions will probably mean that atmospheric CO2 will remain enhanced (relative to pre-industry) for 10s of thousands of years and, in fact, will probably take more than 100kyr to return to pre-industrial levels. If low insolation at high northern latitudes has not sent us into the next glacial now, it seems highly unlikely that it will do so while atmospheric CO2 levels remain higher than they are today. This is essentially (as I understand it) why we expect the next glacial to be delayed for > 100kyr. Whether or not this a profound finding all seems rather irrelevant to the basic point. We’re not slipping towards a proper ice age (correctly called a glacial period, I think, since we’re currently technically in an ice age) and will probably not do so for a very, very long time. So, ATTP, are you agreeing with Paul that “It is worth reflecting on just how profound this finding is” was a ridiculous thing to say? No, I think it is quite remarkable that what we’ve done over the last 150 – 200 years has probably shifted the next glacial by about 50000 years. Thanks. Your need to use the word ‘probably’ makes ‘just how profound this finding is’ truly hilarious. So, if I had said “definitely” you’d be more convinced? US cold snap is put in context by the global map here showing warmth elsewhere, eg in the Arctic and Siberia. As for the Energiewende, it started as a desire to return control of energy production to local communities not anti AGW. They are being highly hipocritical with all the coal but at least I’d credit Germany with creating the global solar industry. Though in the wrong place in northern lands, in sunny places it transforms the picture. Ken, you are aware of the fact that insolation at high latitudes was even lower than it is today at or very near the temperature peak of the extended interglacial period which occurred approximately 400,000 years ago? The goalposts are best not changed here, though I fully understand your desire to do so. What we’re looking at is a public statement by two climate scientists in The Times today in response to Matt Ridley’s article on global cooling on Monday, not Richard Betts responding to who knows what on Twitter eight days ago. I respect you for putting ‘probably’ rather than ‘definitely’. But not for refusing to laugh with us at this letter, not least the phrase ‘just how profound this finding is’ when what they’re talking about is not remotely a finding. It’s difficult to determine if ATTP’s last few posts mean he supports or denies CO2 to be the most important control affecting climate. What I tried to show was that CO2 is a rather weak control, easily over-ridden by other factors. The warmist argument always has depended upon explaining the relationship between CO2 and temperatures at glacial to interglacial episodes (I.e. warming intervals). Initially you remember warming was attributed to increasing CO2 causing an enhanced greenhouse effect (remember Al Gore’s cherry picker?). Unfortunately, it was then shown that CO2 rises lagged behind temperatures. After a period of retrenchment, the greenhouse effect was resuscitated – now CO2 acts to enhance the temperature rise by causing an enhanced greenhouse effect – essentially the story that ATTP is trying to peddle. Accepting this means the interglacial temperatures were significantly higher than they would have been without the CO2 greenhouse effect, and during the Eemian Interglacial temperatures were substantially higher than temperatures today. However, if we now turn to the succeeding interglacial to glacial transition, temperatures plummet but for tens of thousands of years CO2 remain at the high levels which, during the preceding interglacial created a greenhouse effect, supposedly capable of enhancing temperatures well above what they would have been without the greenhouse effect. So we have this contrast – during warming intervals CO2 acts to enhance temperatures, but during cooling intervals, the same levels of atmospheric CO2 are completely unable to prevent cooling. Furthermore, despite the passage of tens of thousands of years during which ice caps grew and almost the entire biosphere was shifted equatorwards and much-lower productivity regions like the tundra grew, atmospheric CO2 levels remained both stable and high. My conclusion from this is that CO2 levels had little to no control over temperatures, they were for long episodes completely independent of overall atmospheric temperatures, and therefore today will have no influence whatsoever on the timing of the next glacial period. I am willing to speculate that atmospheric CO2 levels will correlate well with average ocean temperatures that apparently can be obtained from an analysis of nobel gases trapped in ice cores. I write the regularly but if CO2 and insolation with a bit of SO2 and a few other players (that are recorded in ice cores), the scientists should be able to simulate the glacials and inter glacials. If climate modelling is easier to work out than next month’s weather then glaciation modelling should be a doddle. Those pesky year to year or even century to century wiggles due to ENSO and eruptions shouldn’t alter the overall shape of the charts… except I know of no such model output. I’ve looked time and time again at the insolation and eccentricity, temperature and CO2 charts and I see no pattern. Sometimes the temperature falls when it looks like it should be rising and at other times it rises when there seems no reason. The only claims I’ve heard about the current interglacial is that it might be a double one because the conditions look a bit like 400,000 years ago. Like that’s scientific. I suspect that Ridley is considering a Little Ice Age event, which cannot be ruled out considering the steadily decining GISP2 ice core data since the holocene climatic optimum. Game, set and match to Milankovich? Not quite. Most of the article is viewable courtesy of the GWPF. In the vostok ice core is is visible that an ice age begins gradually and ends abruptly. Germany hasn’t ‘abandoned’ anything. It’s put the date back a few years, probably just long enough for the current leadership to get out of the way and dump the whole mess on some other mugs. At the moment they seem to be expecting coal to prop up the system when/if nuclear goes in the next few years. Merkel has certainly put the brakes on Energiewinde and the German Green Blob. She can do a slow U-Turn if she wants to. This may also calm the nerves of those Germans with anti EU sentiments. Alan, I have always been suspicious that the CO2 as THE control knob was just covering our ignorance of the processes that resulted in the ice ages. Your expert thoughts have cemented this opinion. Please put any ice age comments on the new thread. Germany’s reputation as a green leader is slipping, after reports this week the putative government will give up on meeting its 2020 emissions target. Experts described a draft coalition agreement that defers the goal as “disheartening”, “problematic” and “very weak”.